This EPS8266 development board (HCDVBD0027) is based around the very popular and low cost ESP8266 wireless (WiFi) microcontroller module. It uses the ESP-12E version of the module, which is pre-soldered to the development board. The board itself not only provides a set of standard header pins, which gives access to the modules digital and analogue pins, but also includes some extra components that allow the development board to be used as a development platform for experimenting with some of the features of the ESP8266. 3x AA battery holder allowing the development board to be used as a portable remote sensor. A photo-resistive sensor connected to the analogue input of the EPS8266 allowing ambient light levels to be measured. A 3 colour RGB 5mm LED connected to digital pins 12 (green), 13 (blue), and 15 (red). When used with the PWM capability these pins allow for over a million variations. 6 surface mount LEDs which can be controlled by GPIO pins 0, 2, 4, 5, 14, and 16. Compatible with the Arduino IDE via the board manager extension. To program the ESP8266 the supplied jumper should be fitted to the programming header. In normal operation this jumper must be removed. 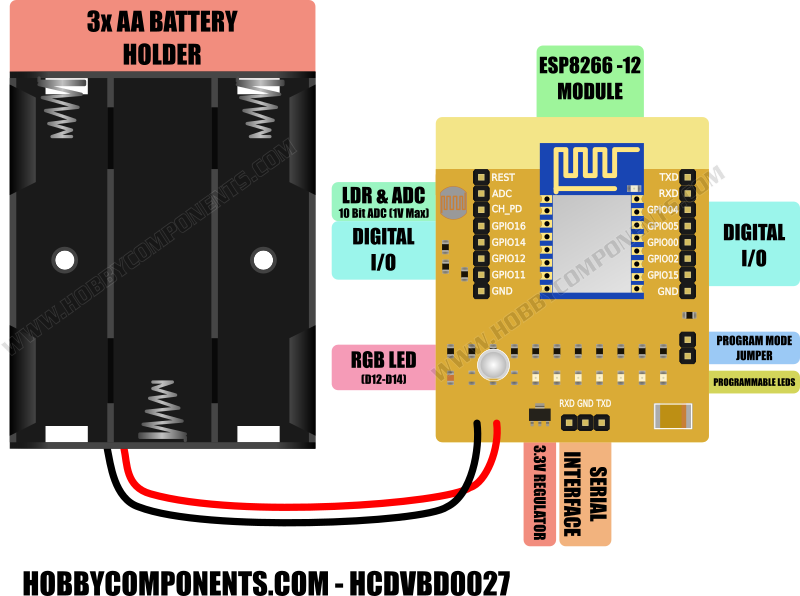 To put the ESP8266 into programming mode cycle either the power supply or the reset pin whilst the programming jumper is inserted. When in programming mode the RGB LED will be a blue-green colour. When inserted, the programming jumper will connect GPIO pin 0 to ground. You should therefore avoid configuring GPIO pin 0 as an output. To connect the ESP8266E development board to your computer you will need a USB to serial interface adapter. The adapter we recommend is the CP2102 (HCMODU0051) which is specifically designed to interface to devices with 3.3V logic levels. Please note that when used with the Arduino IDE the AT-Thinker firmware will be overwritten. This depends of several factors such as the capacity of your batteries, the mode of operation, use of LEDs, and WiFi connection. If the microcontroller within the ESP8266 itself does not need to be executing code for extended periods of time then you can significantly increase battery life be putting the entire ESP8266 into a deep sleep state with the command ESP.deepSleep(sleepTimeIn_mS, wakeup_Mode). This command will power down both the radio and digital parts of the module for a set amount of time (specified in milliseconds). After this amount of time has elapsed the ESP8266 will wake up (see note below) in a reset state and will start to execute code again. Putting the ESP8266 into this mode will reduce the development boards current consumption to ~2.5mA (this includes the power LED) and increase the operating time of batteries to about 480 hours (~20 days). Note: If using the timer wake-up feature of the deep sleep mode you will need to connect GPIO pin 16 to the reset pin. This will allow the ESP8266 to wake itself out of deep sleep by cycling the reset pin. 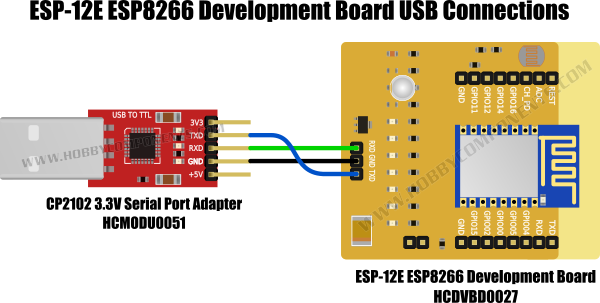 The ESP8266 will store the current sleep state. This stored state will also survive the device being re-flashed with new software. Ensure LEDs are only on for a minimum amount of time. Before putting the device into one of the sleep modes configure all GPIO pins as inputs and/or ensure all LEDs are off. If you can guarantee that your battery voltage will not exceed 3.6V and not fall below 3.0V then you can save even more power by bypassing the on board regulator. Disclaimer: Libraries, example code, and diagrams are provided as an additional free courtesy by Hobby Components and are not sold as part of this product. We do no provide any guarantees or warranties as to their accuracy or fitness for purpose.